This page shows details of payments made by the user towards Tender Document Cost (TDC) and Earnest Money Deposit (EMD) during the last 30 days. 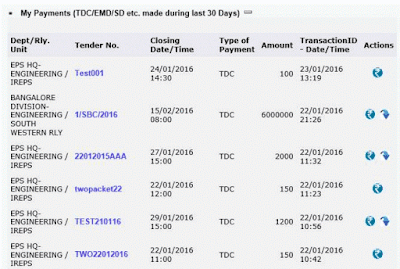 The page shows the Tendering Department, Tender Number, Tender Closing date, Type of payment (EMD, TDC etc. ), Amount paid, Transaction date/time and the actions that can be performed by the user. The Action column of this page contains Action Icons for Viewing / Making payments, and Bid Preparation/ Submission. The actions that can be performed through these icons are described in detail in sub-section Action Icons and their Actions of this manual. If the tender has not lapsed i.e. 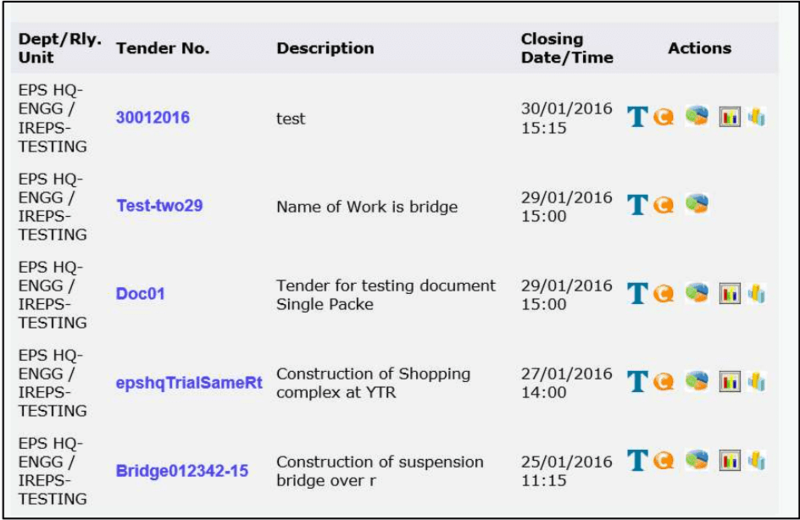 if the tender closing date/time has not already passed, the user gets the Bid preparation & Submission icon in the Actions column. The View / Make Payments action icon always appears in this folder to either make payments or to view payments made (if payments for TDC and EMD have been made). The bidder is required to pay the Tender document cost as well as Earnest Money before he can prepare and submit his bid. If any payment towards TDC or EMD is pending, clicking on the Bid preparation icon takes the bidder to the payment page. Clicking on the Tender number of any tender opens the Tender dashboard. Depending on the status of the tender (live/opened etc. ), the dashboard shows various buttons to view the tender document, techno-commercial tabulation, Financial tabulation etc. This link displays the details of the tenders for which tender enquiry has been addressed to the contractor by the department or the tenders for which the vendor has paid the TDC, and the tender is still open for bidding. 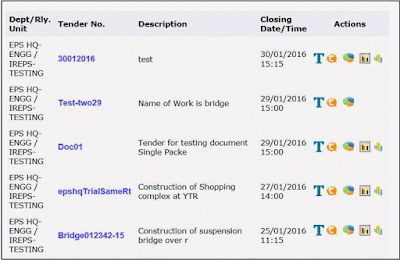 The page shows the Tendering Department, Tender Number, Name of Work, Tender Closing date & time, and the actions that can be performed by the user. This link shows the tenders against which the user has submitted the bid, and the tender is not yet finalized. The Action column of this page contains Action Icons for viewing the tender document, viewing corrigenda issued against the tender, viewing the offer submitted by the user, viewing Techno-Commercial Tabulation statement and Viewing Financial Tabulation Statement. The actions that can be performed through these icons are described in detail in sub-section Action Icons and their Actions of this manual. The links in these categories are under development, and users will be notified as and when these links are activated. This link displays the messages sent to the users by EPS administrator, or the messages related to issue of tenders/ corrigenda for tenders which are addressed to the user, or for which he has paid TDC. The Action column in this page contains view details and Delete Message icons. Please check your message box regularly as it may contain important and urgent messages regarding publication of tender or corrigendum etc. requiring your immediate attention. This link shows the messages that the user has deleted from his Inbox during the last 30 days. I had submitted the tender, even got the Bid ID but under the section "Closed Tender", I can't see anything, It's written.."No Result Found".. Please help me.. What could be the reason ? Your tender will appear under "Closed Tender" section when it becomes lapsed (closed for bidding). Before closing date/time of the tender your tender will appear under "Live Tender" section if you have invited for the tender or you have paid the TDC amount or submitted the bids. As per process it should be shown under "Tender Closed" section if you have submitted the bid(s) successfully. I have called the helpdesk,they told me to use "tender search option" to see the closed tender and they also told me that,when tender gots open.. tabulation would be shown there. So as per yours view, tender was not successful submitted? 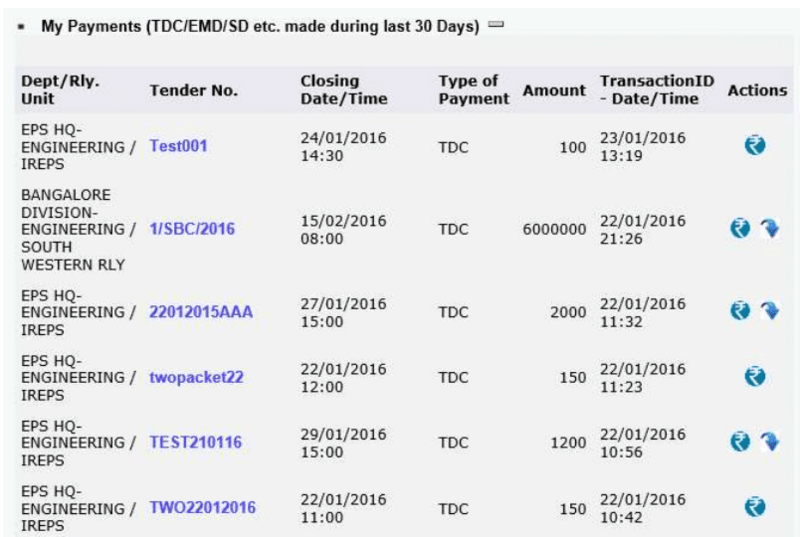 May be IREPS changed their process and now showing the tenders under "Closed Tender" section only after opening of the tender. Thanks for your update.